Apple's newest flagship device, the iPhone X, has the best smartphone camera currently available according to new rankings published this week by Consumer Reports. Furthermore, Apple devices took up most of the spots on Consumer Reports' list of top 10 smartphone cameras, with the iPhone 8 and the iPhone 8 Plus following the iPhone X. The iPhone 7, 7 Plus, and 6 Plus also earned top 10 spots. Introduced in November, the iPhone X has two 12-megapixel rear lenses arranged in a vertical orientation, one that's an f/1.8 aperture wide-angle lens and an f/2.4 aperture telephoto lens. 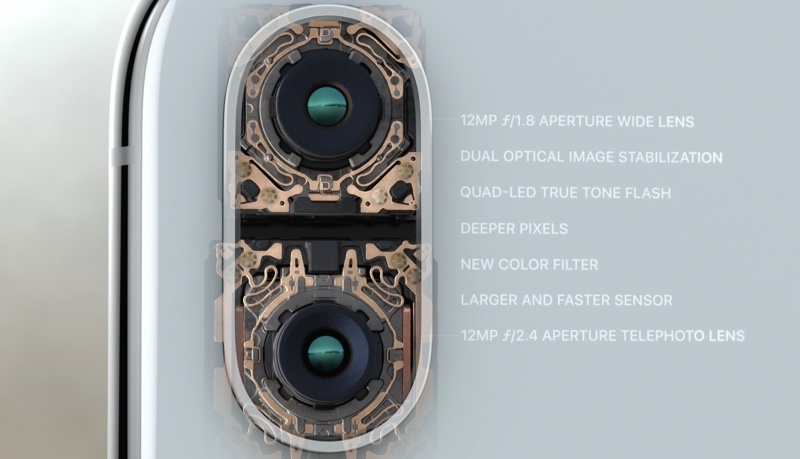 These lenses are combined with features unique to Apple like an Apple-designed image signal processor with advanced pixel processing, improved color filters, a better sensor, faster autofocus, and optical image stabilization for both the telephoto and the wide-angle lenses, a first for an iPhone. The iPhone X's rear camera is combined with the front-facing TrueDepth camera system that enables neat features like a selfie Portrait Mode, which blurs the background of a selfie image and sets it apart from the iPhone 8 and the iPhone 8 Plus. Apple has also done a lot of work on software to complement the camera offerings on the iPhone X, introducing features like Portrait Lighting for adding studio-quality lighting effects to your images. The result of all of these features is the best camera that's been introduced in an iPhone to date, and it's been highly praised in reviews and evaluations. Photographer Austin Mann, for example, said the iPhone X camera was the "most exciting" upgrade he'd seen since he switched from a Blackberry 7230 to the original iPhone back in 2007. Photography site DxO gave the iPhone X's camera a score of 97, higher than any other iPhone, while DPReview, another noted photography review site said it is capable of "extremely impressive" results. Apple smartphones have long been some of the most widely used and popular cameras available, topping the list of Flickr's most popular camera for multiple years running. The iPhone's popularity as a photography device has spurred Apple to make continuous improvements to photo quality with each new iteration, and iPhone image quality is now at the point where it comes close to offering the kind of effects you can get with a DSLR camera. Consumer Reports' current list does not include the Galaxy S9 and the Galaxy S9+, and it will be interesting to see how Samsung's newest devices measure up to the iPhone X. Both of Samsung's latest smartphones feature Dual Aperture 12-megapixel lenses with f/1.5 and f/2.4 modes, with the lenses able to switch between these two apertures depending on the lighting conditions. This kind of Dual Aperture functionality is useful for finding a balance between light and image quality. The f/1.5 lens is useful in low lighting conditions because it lets in more light, but with a wider aperture comes a compromise in image sharpness in certain areas of the photo. Therefore, in conditions where the lighting is better, the f/2.4 lens that's also included will provide a crisper, higher-quality image. I honestly think from what I've seen on YouTube and what not that the Google Pixel 2 takes better pictures than the iPhone X. 8 better than 8+... 7 better than 7+? How the heck does the 8 PLUS loose to the 8? This list looses credibility by that fact alone. SURELY this is a typo? I guess this was the obvious observation to make on this list. Your post beat me by milliseconds, I'm sure! BREAKING: More evidence continues to trickle in confirming that Consumer Reports has completely lost their mind. Pixel 2 has the best camera, and it hilariously is not even in their top 10. Why did they not test the Pixel 2?